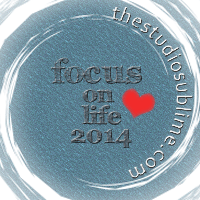 I was so happy when Sally, from The Studio Sublime, continued in 2014 with her wonderful photography challenge, Focus on Life. I have to say I was quite pleased that I managed to photograph and post for every single one of the 52 weekly photo prompts in 2013. This was a challenge that truly made me stop and think about my surroundings and the things going on in my life each week and I thoroughly enjoyed the entire journey last year, along with all the wonderful and caring people I 'met' along the way. So, when I saw the information for the 2014 Focus on Life Photography Challenge, I signed up immediately! Sally's changing things up a bit and will be focusing on a specific subject each month, with weekly prompts pertinent to that subject, for us to post each week or just keep to ourselves if we choose to go that route instead. She's also giving us tips, techniques and photo recipes through out the year so we can better our picture taking skills as well. Every year we approach the new year with high expectations of changing your lives. We jump in with both feet and the water quickly splashes over our heads, we begin to feel overwhelmed. Before we know it the water subsides carrying our expectations in its ripples and waves. We reach, we grasp, but everything becomes out of reach. We sink. Our progress stops in its tracks and with head hanging low we feel like we have completely failed. Let's change the view. This year let's focus on entering 2014 by first tiptoeing into the lapping water, testing the strength of the waves. Let's give ourselves a better chance to succeed, to feel good about ourselves, let's allow ourselves to reach our fullest potential. Let's use the minimalist's approach, strip down to bare bones and chose one or two goals to pour our energy into for 2014! Let's scale back the world around us and focus our viewfinder on one subject and snap the shutter. I was out for a walk and discovered this single leaf laying in my path that captured my attention and thought it would be perfect for this week's prompt. But once I got back home, I noticed that the shadow behind it and the concrete it was laying on completely distracted from it's minimalistic simplicity. So instead, I captured one of my 'loves'. Feel free to check out all the links below and see what Single Subjects the other players captured in their Minimalist Photograph this week! Peace, Love and The Single Pearl! I love how the light reflects off of her. Great photo. Oh yes, she's a beauty. She even takes a great close-up. Not many can say that! What a beauty, great post Mishel!! Beautiful pearl and sweet color! Thank you and I do love the color of this one! Great shot! You captured the luster on the pearl beautifully. Thanks - it was hard to decide,...but my heart won out w/the pearl! She is indeed a beauty! I never met a pearl I didn't like! Wonderful depth from a simple pearl.Great shot, and a great choice. Great photo Shel. 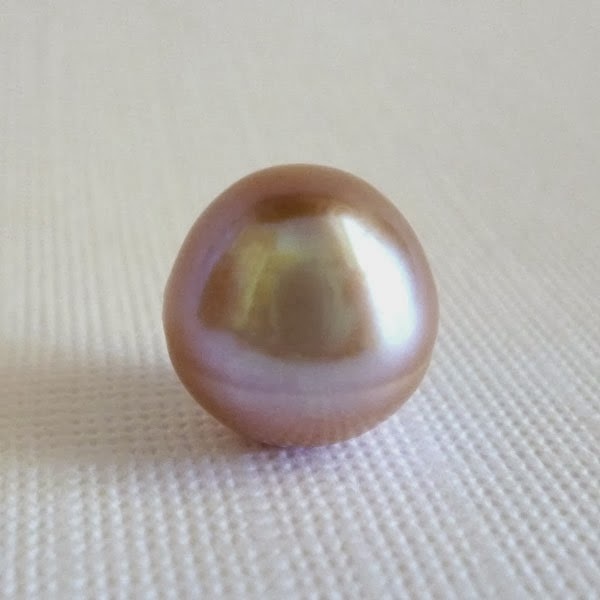 What could be better than a pink pearl? Yes she is a beauty. I love pearls too and you really captured that silky satiny feel. A beauty indeed and makes for a gorgeous pictures with those wonderful shimmers of colour. Beautiful pearl and I love the lighting in your shot. Mm, she IS beautiful! In fact, all your work is :) Happy new year! Thank you so much! And, welcome to the weekly challenge - it's an amazing group. You're gonna love it. She is indeed!! And you've captured her beautifully! Thanks. And to you as well Claire! You definitely have the gift of pearl magic, Shel! I can see why they inspire you. Beautiful! I've always loved pearls, but following your blog over the past few years has given me a whole new appreciation for them. Beautiful photo! Congrats on going the whole Focus on Life year in 2013 ... that's such a great accomplishment! That is a pretty incredible "second choice" So happy to be on another road with you. Happy New Year! You certainly gave us a photo that shows the simple essence of a single pearl. Marvelous! And a wonderful start to another year of photo journaling. Wow, what a stunning pearl and so beautifully captured. I love the warm glow to it.